The image and the composition look strange to those of us used to Western art, because they are heavily influenced by the Byzantine tradition – that’s the Eastern Catholic church in Constantinople. There’s a lot of gold and the pictures lack perspective. Although there’s a bit of depth created by the use of shadow and the folds of Mary’s gown, on the whole these are ‘flat’ images. 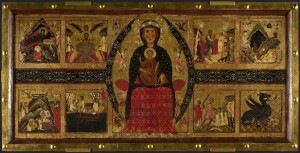 Mary is wearing a crown typical of Byantine art and, if you look at the Christ figure, although he’s the size of a baby he’s painted as a much older child, almost as a little man, and he is wearing scholars’ robes and holds a scroll in his left hand. Again, these are ways of representing philosophers and men of wisdom in Byzantine and medieval Greek traditions. The eight background scenes show, in the top left, the nativity, with next to it John the Evangelist being rescued by an angel from a vat of boiling oil. Bottom left is St Catherine being beheaded and her body then carried by angels to Mount Sinai, and then St Nicholas warning pilgrims that the devil has given them deadly oil – you can see them pouring it into the water where it catches fire. On the right hand side, first of all there is St John again, raising Drusiana from the dead, and in the top right corner, St Benedict fights the temptations of the flesh by rolling in thorn bushes (!). Below that on the left is St Nicholas again, this time rescuing three young men from execution. In the bottom right hand corner we have St Margaret in prison, shown by the diagonal lines across the image, where she is eaten by a dragon, but emerges whole and alive from its belly – which is why Margaret is the patron saint of women in childbirth. Each scene has a Latin caption above it, and Margarito has signed his name in Latin beneath the Virgin’s feet. This is the earliest signed picture in the gallery, and we might see this as a move from paintings being done by anonymous craftsmen, to named artists. There’s also a hint of a change from the perspective-less art of the Byzantine and that’s with Mary’s feet. They ‘rest’ on a frame and project into our space – a small sign of the way in which the visual language of painting will develop.